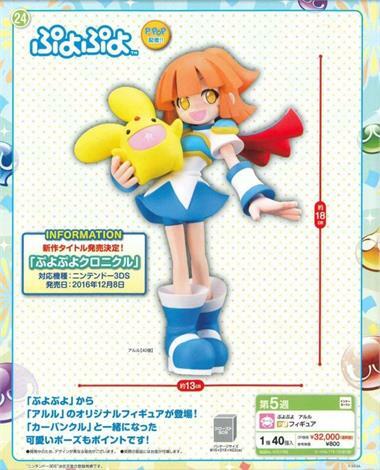 With the new Puyo Puyo Chronicle game shipping on the Nintendo 3DS on December 8, 2016, Sega also releases a Puyo Puyo Chronicle Arle figure who cradles a Carbuncle figure against her bosom. The year 2016 marks the 25th anniversary of the Puyo Puyo franchise so it's only fitting that Sega mark the occasion with a new game as well as a new toy. The figure measures 18cm or 7.08" tall and is sculpted from PVC. Orders are welcome to ship in late December 2016.